Republican Scott Brown and Democrat Martha Coakley are running for the US Senate seat long occupied by Ted Kennedy. Not shown is Libertarian Joe Kennedy. THE POLICY DIFFERENCES between Democrat Martha Coakley and Republican Scott Brown (not to mention the third-party candidate, Libertarian Joe Kennedy) were as clear during last night's debate as they have been throughout this short special-election campaign. 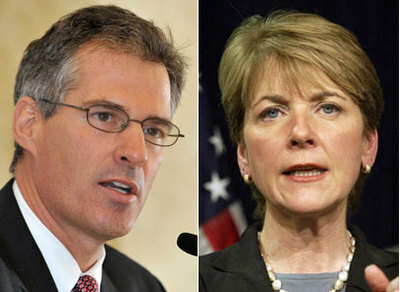 Coakley supports ObamaCare, opposes the war in Afghanistan, and favors higher taxes on the wealthy. Brown is against the health-care legislation, backs the president's troop surge in Afghanistan, and wants across-the-board tax cuts à la JFK. Coakley is an EMILY's List pro-choice hardliner; Brown condemns partial-birth abortion and is backed by Massachusetts Citizens for Life. Coakley has no problem with civilian trials for the likes of 9/11 mastermind Khalid Sheikh Mohammed. Brown thinks it reckless to treat enemy combatants as if they were ordinary defendants. But the most striking thing about the final televised debate before next Tuesday's election was not that the very liberal Democrat and the not-especially-conservative Republican disagreed on the issues. It is that they are both viable candidates in a US Senate race too competitive to call. In Massachusetts! "I don't know what's going to happen on January 19th," Coakley said toward the end of last night's encounter. She wasn't being coy. Nobody knows what's going to happen next week. When Ted Kennedy died less than six months ago, who would have guessed that the contest to win the seat he occupied for 47 years would be anything but a slam-dunk for the Democratic nominee? Yet there was no slam-dunk on that stage last night, and the race certainly doesn't feel like a slam-dunk now. "It's not the 'Kennedy Seat,'" Brown has been reminding Coakley. "It's not the Democrats' seat. It's the people's seat." Amazing thing is, he could be right. Join the Fans of Jeff Jacoby on Facebook.